How will your days on board be filled? 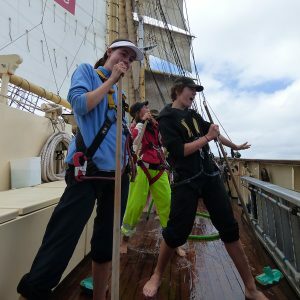 Working together in teams (or watches as they are known on board ship) you will learn the language of tall ship sailing and become a master of ropes and lines, knots and sails. Weather and wind conditions, the watch roster and ship positioning affects the schedule so there is never a dull moment! We invite you to read and learn about STS Leeuwin II’s history and specifications here. On each voyage, the ship accommodates up to 40 participants and 15 crew members (five professional crew and ten volunteers). The permanent crew consists of the Captain, First Mate, Bosun, Engineer and Chef. Leeuwin’s permanent and relief crew have extensive maritime experience and are highly qualified professional mariners. 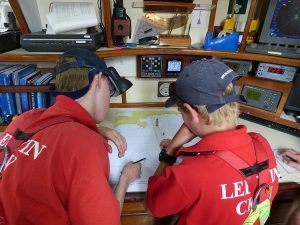 The permanent crew are assisted by trained volunteers who fill the positions of Watch Leaders, Cook’s Mate, Bosun’s Mate, Purser and on occasions Engineer’s Mate and Watch Officer. 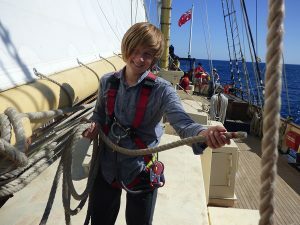 Our volunteers have generally joined us on a first voyage and then come back to continue their learning and development and because they want to assist new voyage participants get the most from their first voyage experience. Find out about STS Leeuwin II crew here. While on board STS Leeuwin II, you will be allocated to a Watch. 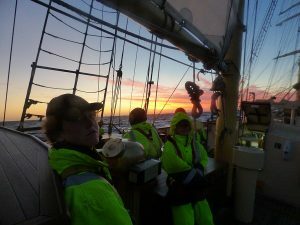 Your Watch Leader will be someone who has sailed on Leeuwin and volunteers their time to make sure you have the absolute best adventure. They will lead activities and your involvement in ship duties throughout the voyage. When you are on Duty Watch, the members of your Watch will take turns as lookout, helmsperson and navigator. The STS Leeuwin II operates 24 hours day. At all times of the day and night, a Watch group is on duty. You will share a cabin with either five or seven other people, divided by gender. There are two communal bathrooms, also divided by gender. The Main Saloon is where you come together with your Watch and other voyage participants for meals, to play board games or maybe pick up the guitar. It is beautifully lined with jarrah and has a comprehensive library. You will feel like you are in another world, in times past! Can my family or friends get in touch with me while I’m at sea? No, sorry they can’t. You are under the care of the Captain and crew. In case of emergency, your emergency shore contact will be advised immediately. Can my family and friends track STS Leeuwin II while I’m at sea? Yes! 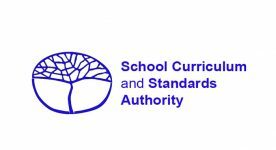 By visiting and bookmarking this link. It’s important to prepare carefully for your journey. There’s nowhere to stop, and shop! And remember – it’s a lot colder at sea than on land – even in the middle of summer. A selection of clothing for warm days and cool nights. It’s always a good idea to have a selection of clothes that you can layer up or down to respond to the temperature. Most of all – pack your sense of adventure and a willingness to get involved and do things you’ve never done before. 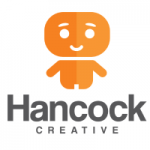 Bring an open mind to the opportunities you’ll be offered and a can-do attitude. The more you put in – the more you will gain from your fantastic adventure on STS Leeuwin II. Mobile phones, laptops—any electronic devices. If you do bring your devices with you, you must hand them into the Chief Officer on Day 1 of the voyage. They will be stored securely and returned to you prior to your departure. SLR cameras or any camera which can’t be secured, and may become a hazard when you climb aloft. We take hundreds of photos throughout the voyage, and will offer you the option to purchase a unique branded Leeuwin USB full of photos ($20). What’s not on while on board? Where should I park or be dropped off? Zone 3 dedicated all-day parking areas near C and D Sheds costs $10 a day (plus 0.8% surcharge for credit/debit cards). 4 hours parking outside A and B Sheds (tip: for this option, select 3 hour parking, then add an additional 1 hour (far right button on machine)). If your voyage is departing from or arriving into ports other then Fremantle, please check local parking arrangements and specific instructions provided by Leeuwin Ocean Adventure. For voyages departing from Fremantle, final boarding time is 10 am. You need to be at Leeuwin’s office at B-Shed no later than 9:45 am. Arrival time for voyages returning to Fremantle is approximately 11:30 am, depending on shipping movements. Trainees will stay on-board for at least 30 minutes before leaving the ship. For regional voyages, the arrival time, departure times and locations will be emailed to you prior to departure. Always check the departure time on the email confirming your booking! Once on board you will be allocated your bunk and the equipment you need for your voyage. You will then have an initial briefing about your voyage and complete safety training before having lunch on board, alongside the wharf. The ship will depart the wharf at approximately 3 pm. The departure time may vary due to shipping movements in the port. Allow time to purchase gloves, hats or any of our branded merchandising before boarding. A small selection of merchandise is carried on board. Do you offer transport to regional ports? Bus transportation to regional ports might be offered as an option, with prices varying upon destination. This information will be provided to you as part of our booking process.